﻿It all starts with an appreciation for music. We listened carefully and found that many speakers really don’t sound much like music. You know the music you hear in concert. The music you remember moving you, making the little hairs on your neck tingle. Funk Audio was started to correct that mismatch. We believe that everyone who enjoys music will find our speakers to be some of the most life like and dynamic available, regardless of price. Add to this that we firmly believe that a great speaker is also a great work of art. Our attention to detail in the arts of wood and metal working are becoming the stuff of legend. We don’t build the type of speakers that you could simply buy from a big box store, and we never will. Rather, we are very aggressive and diligent when we design a system, and the proof of these qualities can be heard around the world, literally. With a customer base that covers a wide variety of cultures and tastes, we have never had the option of creating a sub-standard system. We are passionate about great sound, we love real stereos, and it shows. Funk Audio uses zero MDF in the construction of our enclosures. We mainly use Baltic Birch plywood. This material has very high strength and stiffness. This material will outperform MDF in nearly every way. The combination of build quality and our stressed skin construction methods make our use of Baltic Birch a natural choice. It raises the cabinet resonances higher up in frequency than you will find in other enclosures. As there is less energy in music as frequencies increase it is much easier to dissipate and control through careful use of damping strategies. For any loudspeaker, but especially high powered subwoofers Baltic Birch is one of the best choices. Funk Audio can use solid aluminum plate and billet for many of our designs. It is the most costly material for speaker cabinet construction but cannot be beat for strength and stiffness. With the variety of colours available in powder coat and anodized finishes, aluminum is a wonderful option for a edgy and modern look. Funk Audio can also incorporate Corian solid surface material for baffles, and cabinet tops. The look of this material will add presence and sophistication to the speaker system, and can compliment a endless variety of home decor finishes. Funk Audio incorporates AllDSP hardware into all our subwoofers and active loudspeakers. We can also custom design and incorporate the technology into custom built amplifiers, both stand alone mono and multi channel units, as well as actively powered and signal processed, and full range speaker designs. Planar tweeters are much different than conventional moving coil designs. Rather than a dome style tweeter that has a voice coil, suspension, and dome shaped diaphragm, the Planar tweeter uses an ultra thin high temperature polymer suspended in a magnetic field. This simple assembly performs all the necessary functions of a diaphragm, suspension, and voice coil, all in one very lightweight part. The high energy motor used in the Planar assembly coupled with the very low mass of the planar diaphragm results in very fast responsiveness. The exceedingly low inductance of the single plane voice coil facilitates an extended high frequency response. Planar tweeters, have a very detailed accurate sound. They offer some of the highest efficiencies available in high frequency reproduction. And they do this with the lowest possible levels of distortion. 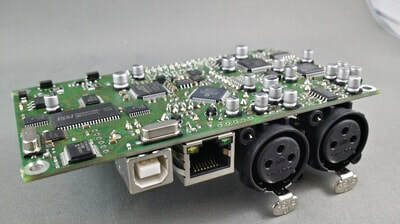 Funk Audio uses many drivers featuring “Neodymium” motors. They can be used to great effect as a high efficiency motor force in our drivers. We firmly believe that a more efficient driver sounds clearer and more articulate. We carry this objective from the top frequency ranges all the way down to the sub bass levels. It is part of our sound ideology. A strong motor will provide a very firm grip on our diaphragms, be they cones or planar membranes. Think of it as horse power to get you moving quickly. And massive brakes to stop you on a dime. This translates into real world distortion figures that are much lower than our competition. And that you can hear from the moment you first hear our products. They have no real sonic signature. They are as faithful to the music as we can make them. All of our motor s have a high BL product or a ratio of motive force and the wire length in the voice coil. In fact our subwoofers have some of the highest BL figures you will find in the industry. We continue to refine and improve our drivers. Stay tuned there are many things in the works! 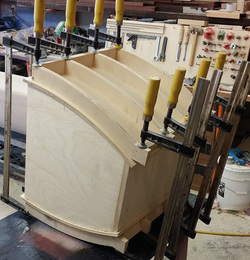 We build many of our cabinets using laminated curved wall construction. This style is very unique, attractive, and combines a classic and modern look. This type of construction can be significantly thinner and lighter with improved stiffness, resulting in superior dampening and sound detail. We also offer this capability for custom designs. We use the vacuum pressing method for applying veneers. This is a very simple process where the cabinet and veneer are put in a sealed bag and a vacuum is pulled inside allowing the atmospheric pressure of up to 14psi to provide an even clamping pressure over the entire veneer surface to insure 100% adhesion of the veneer to the cabinet, providing a stable product that will last many years.